I try and find that perfect location that I think will have a beautiful backdrop to help tell a story. Your location is key to achieving successful photographs. Anyone can take pictures of fireworks, but telling a story and having the right cast members, foreground, middle ground, and background elements is what can set your images apart from everyone else. If you’re unfamiliar with a location, go out the day before and try and find the perfect spot to capture your fireworks. Once a location is found, I try to get there early. This is to assure I can get a good seat and so I can setup my camera. If you know your location or it looks like a popular area you will want to arrive several hours early to make sure you can still get a good spot. It is easier to setup your gear while there is still light. Once the location is found and all your gear is setup, manually set the focus for your scene before it gets dark. Focus on an area of sky where the fireworks will be, or on an object the same distance away. Once the fireworks start, you’ll be ready to start shooting. This is a general guideline for what you can do. You will find over time and with more experience your own style or tweaks that work best for you. I tend to setup my camera at ISO 100 or 200. I do this so I can achieve the best quality of image I can. Some people say this is all you change while capturing fireworks. I don’t really follow this guideline because it doesn’t make sense to me. I tend to change my f-stop or shutter speed first because I do not want to lose any quality with added noise. This can vary, but I usually stay between F/8 and F/16. The middle ranges will give you the sharpest images. When I am missing firework bursts because the camera isn’t recording them, I will adjust my f-stop by lowering it a few stops which will help record the light from the firework. When I photograph fireworks, I use my bulb setting with a shutter release cable. This lets me control how long the shutter stays open. I try and only keep the shutter open for one or two explosions. The longer you keep the shutter open the more there is a chance of washing out the color of the firework which is over exposing the scene. If your images are too dim, try and leave the shutter open longer. If you are not capturing any bursts of fireworks, you can also lower your f-stop to allow more light in to help expose the fireworks. I leave this turned off while photographing fireworks. They do not always work best with tripods and can cause more harm than good. Image stabilization systems (IS/VR), looks for camera shake when hand holding your camera and adjusts for it. When it is not needed and is left on, the image stabilization system creates its own camera shake. I turn this feature off because we won’t be doing long enough exposures to have to worry about a buildup of noise. Also, if you take a ten second exposure, it takes ten seconds before you can take another photograph. A ten minute exposure would take another ten minutes before you can take another exposure. This may not be true for all systems, but in my experience when I have used it this is what happens. You can leave this on auto. Others may disagree but I have never had any issues setting the white balance to auto. Avoid trying to get to many bursts in one exposure. The longer you leave the shutter open the faster you will over expose the image. Remember fireworks are bright. Yes you are shooting at night, but there is a lot of light from the fireworks. Try and get the early fireworks. The longer the show goes the more smoke that will fill the air. Avoid the finale, there is too much going on and it is almost impossible to get a correctly exposed image. You can use a black card to create multiple exposures in one exposure on a digital camera like in the film days. Use a black card to recreate your shutter. While in bulb mode, use your shutter release and lock it. This will leave your shutter open. Place the black card over your lens. Once you hear the thump of the rocket taking off, remove the card to record the burst. Cover it back up and wait for another. By doing this you can create multiple bursts without over exposing the fireworks. This may take a few shots or years to master but you can create some amazing images this way. The only drawback to this is that you could end up with several bursts in the same location, overlapping each other. In my experience this is not usually a good thing. Sometimes you can see a trail from the firework which will allow you to gauge the height and which will help you decide if you should capture it or not. Once you hear the thump of the rocket taking off you don’t always have to push the shutter. Sometimes you do not want a lot of trails from the rockets within your image; this can be distracting and take away from your scene. You can judge the average height of the fireworks and can guess when they might explode. Wait for the rocket to get to that average height then push the shutter. This can also help with getting more shots in your scene without over exposing. Be creative and play. When I capture fireworks I tend to do it with one or two bursts in the scene. I then composite them together using Photoshop. Yes some will say it is cheating but we have the tools at our disposal so why not use them. Not all of my photographs are composites. I sometimes tend to capture the scene before the fireworks begin. I will take some shots at various times during dusk. I then will composite the fireworks into the earlier scene. This can be fun and once again lets you be creative. Everything I have talked about can be applied to your camera phones and point and shoot cameras. There are some slight differences. Using your tripod, or something to keep your camera from moving, set your camera to manual mode. You will need to set your aperture to what was mentioned earlier. The difference is to set your shutter speed to different times, unless you can use a shutter release cable with your phone or point and shoot camera. Try starting with two seconds and see if that works to capture the fireworks. If that doesn’t work try different times: 2, 5, 8, 10, 15, 20 seconds. You may also need to adjust your f-stop to a lower number to let more light in or a higher number to let less light in. 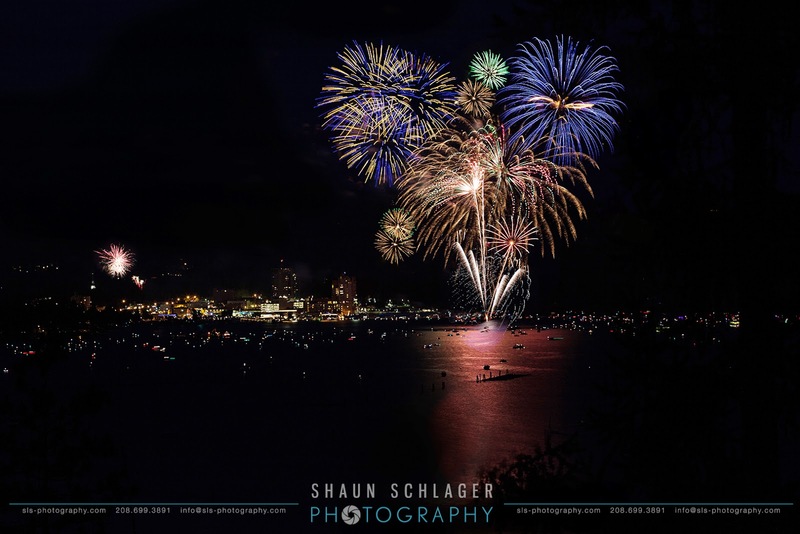 I hope this has helped you grasp a little bit better understanding of how to capture fireworks. If you have any question please feel free to email me.